The Queens Detention Facility at 182-22 150th Avenue in Jamaica. The US Marshals Service and private prison operator GEO Group are currently in negotiations to extend the company’s contract to operate a private detention facility in New York City. According to Lynzey Donahue, a spokesperson for the Marshals Service, the contract expired last fall and has been repeatedly extended, now through March 31st, while negotiations are ongoing. The facility in question is the only privately run detention facility in New York City and is classified as medium/minimum security. It holds 220 detainees facing federal charges, many of whom are awaiting trial or transfer. According to a breakdown of detainees in the facility last May, there were 215 detainees in the facility, many facing charges related to drugs, violence or weapons. 44 were non-us citizens and 27 detainees were not facing charges but being held as material witnesses for cases. The Marshal Service is responsible for apprehending fugitives, transporting federal prisoners and protecting federal courts. A request for proposals suggests that a new contract will be for an initial two-year period with four, two-year options to extend. The new contract could potentially be for a 1o-year period. The RFP stipulates that the USMS as well as other federal agencies including Immigrations and Customs Enforcement, the Bureau of Prisons and The Department of Homeland Security could possibly house detainees in the facility. Representatives from the Marshals service did not return requests for comment about the details of current negotiations. GEO Group spokesperson Pablo Paez also declined to comment. It is unclear whether other parties have submitted a proposal. The former contract for the operation of the facility ran 10 years from 2008 until last fall and exceeded $24 million in value some years. The payment structure was based on per-diem rates per detainee, but those were redacted from this FOIA’d copy of the contract. The contract also required that the jail meet all federal standards of detention and that there be at least 20 segregated, special housing units. In addition, it required that GEO Group bear all costs of litigation brought against it. Though information about conditions inside the facility is sparse, there are currently three pending lawsuits in New York State court against the GEO Group relating to treatment of detainees at this facility. The extension of the Queens Detention Facility contract comes as activists in New York and around the country are taking aim at GEO Group and its competitor CoreCivic for their role in immigrant detention and as activists in New York City are gearing up to oppose the city’s plan to construct new jails and close Rikers Island. Earlier this month, under pressure from activists, JP Morgan announced that it would divest from private prison companies GEO Group and CoreCivic. US Bank later told the Washington Post it had reduced its exposure to those companies significantly. Last week, under questioning from Rep. Alexandria Ocasio Cortez, Wells Fargo CEO Timothy Sloan told Congress that the bank will exit their relationship with the private prison industry. These actions have precipitated a drop in the prison companies’ stock values. Both New York City and New York State’s pension funds have recently divested from private prison companies as well. Also recently, activists targeted the renewal of a contract between the Department of Immigration and Customs Enforcement (ICE) to hold immigrant detainees and a publically run jail in Hudson County New Jersey. The county board voted to renew the jail’s contract with ICE in November, but required another vote in the future to extended it beyond 2020. 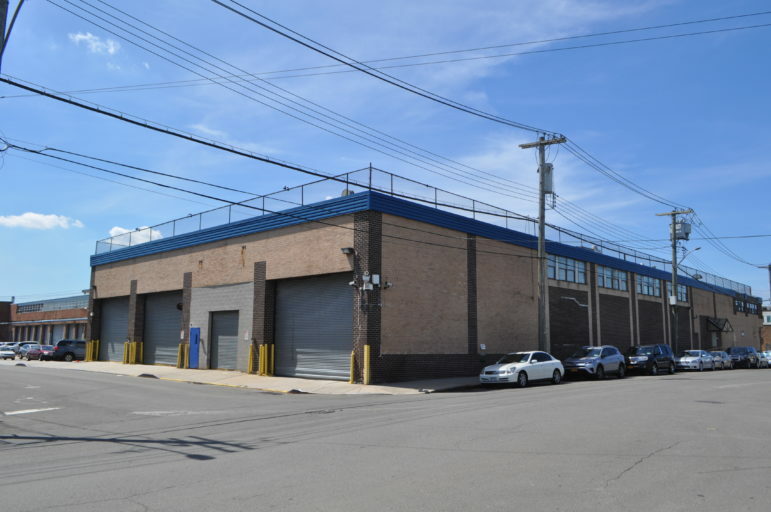 The Queens Detention Facility is located in a warehouse district next to JFK airport. It was originally built as a warehouse, but was acquired by GEO Group and converted to a detention facility for a contract with ICE just before 1997.